Five little squirrels lived up in a tree. And they were alike as squirrels could be. The first little squirrel was alone one day. He called to his friends, "Come on and play!" The second little squirrel jumped down from a limb. The first little squirrel jumped after him. The third little squirrel found nuts to eat. He cracked them and ate them for they were sweet. The fourth little squirrel played hide and seek. She hid her eyes and did not peek. The fifth little squirrel called, "Chirr-chirr-chirr-eeee!" And all of the squirrels ran back to the tree. 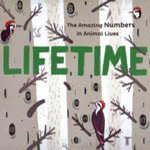 Check out some books about animals! If you can’t visit your library make your own book! Don’t forget to draw pictures to go along with the story!